I just started a new vampire series called the “House of Night” series. There are five books in the series. I bought the whole series at Barnes and Noble because it was under the section that said, “People who like the ‘Twilight Saga’.” So, I thought I should try it! The first book is called Marked. When I first started it, I noticed there was lots of bad language, but a lot of it stopped toward the end. Marked is about a girl named Zoey who gets marked by a tracker. When people are marked they get an outline of a moon on their forehead. She is in total shock because everyone at her school thinks they are freaks. She knows that if she doesn’t get to the House of Night then she will get sicker and sicker until she dies. Her grandma takes her to the House of Night. People who get marked are supposed to go to the House of Night to complete the Change to be a vampire and to train to be a vampire. Some people complete the Change, but others don’t and die. 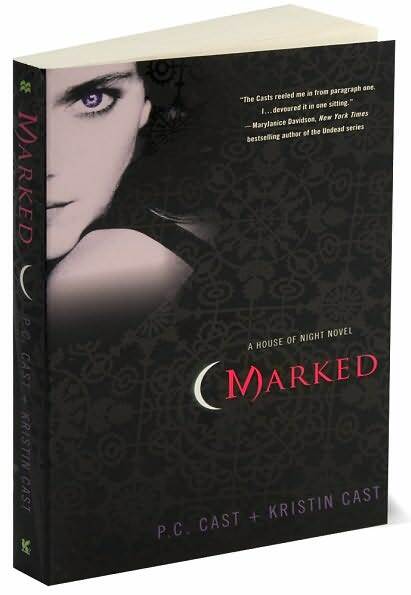 Zoey’s mark fills in and the other people at the House of Night are shocked because no one has a filled-in mark until they are vampires. Zoey makes some friends and they tell her about a group of mean girls called the Dark Daughters. The leader of the Dark Daughters is in training to be a High Priestess, and Zoey doesn’t think she should run the school. So, Zoey and her friends must think of a plan to stop her. I think that Marked is a great book. I am now on the second book of the series, and it’s really good also. I think that anyone that likes vampire series should read this, and especially those of you who like the “Twilight Saga”.